Ever notice the way Rheumatoid Arthritis joint redness is depicted? 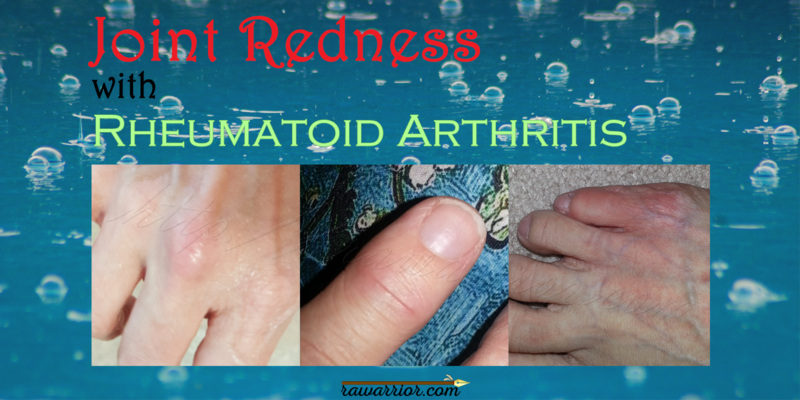 Pictures of joint redness that are supposed to be Rheumatoid Arthritis (RA) have made me laugh out loud for years. Joint redness is often shown with a bright red touchup glow. Why do they paint the joints bright red like ketchup? 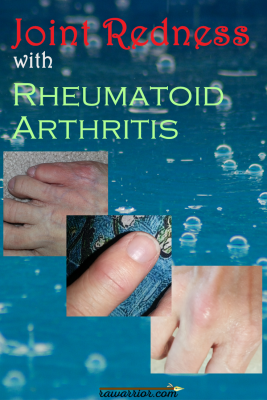 Maybe they can’t find a picture of joint redness in a real Rheumatoid Arthritis patient? It’s probably possible to find a photo like that, but they’re definitely more scarce. Or, maybe the reason is red joints would have to be rather extreme to show up enough to make a powerful photo. So, if a website or book uses an actual photo of joint redness it’s likely a photo of an extreme case. The photos of my hands in this post were taken on days when my joints were extremely red – red enough that I was shocked so I snapped a photo. But without any help from Photoshop, the red in my photos does not look very bright. Only extremely red joints or fake red joints are probably used to make a dramatic picture. Why do many doctors think joint redness is required to diagnose Rheumatoid Arthritis? I’ve heard patients tell stories and read on medical websites that joint redness, swelling, pain, and warmth are all necessary for RA / RD to be present. If a person with Rheumatoid Disease (RD) visits the doctor without all of these, she is taking a risk of being dismissed (or yelled at as a patient described on Facebook the other day). I can tell you from experience, it’s horrible to be dismissed when you come for help because you can’t function. Just like the myth that RD has to start in the joints, and must strike the hands first, the notion that joints affected by RD have to look red is flawed. That’s too gentle – it’s ridiculous. If only patients could use Photoshop when they go to the doctor. Do I finally have RA / RD now that I have joint redness? Did I have RA / RD all those years with periodic joint flares I didn’t really complain about? Or did I really have it when it became full blown 24/7 and spread to every joint in my body, but with swelling that was intermittent? Or did I finally have it when I was diagnosed with Rheumatoid Arthritis a few months later? Or did I finally have RA / RD when I started having frequent dramatic joint swelling? Or… do I have it now that I have recurrent joint redness? The fact is I had it all the time. As I’ve been saying for years, RD appears differently in different people, and in the same person over time. 1) Pictures are powerful, so people may expect something more dramatic than what patients can show them. 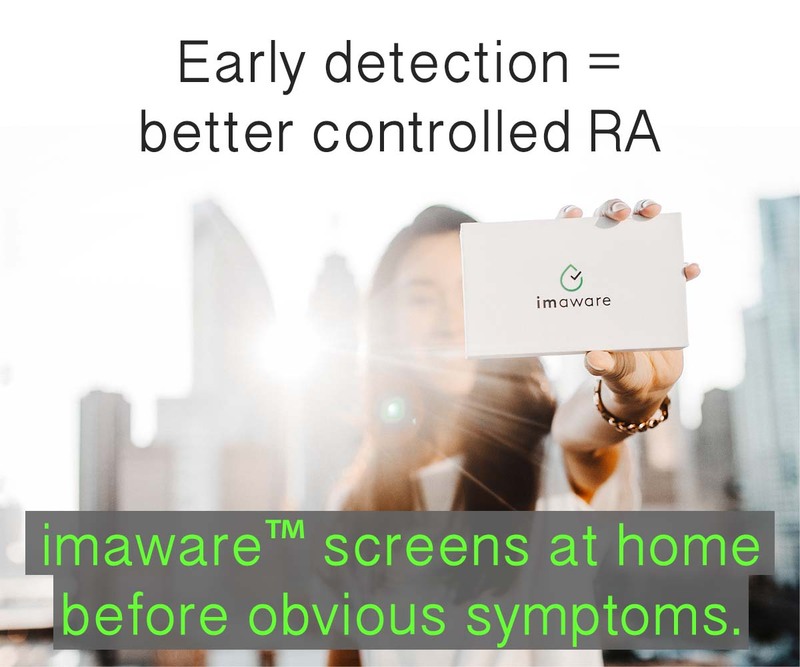 2) Visible RA / RD symptoms like joint swelling and redness can vary over days or even hours, and they are not always the first symptom. 3) Visible symptoms like redness or swelling do not correlate perfectly with other symptoms like stiffness, pain, weakness, or fatigue. If what people, including doctors, see for examples of RD joint redness or swelling are either fake pictures or very extreme pictures, what do they think when they see us? If only our joints would light up and glow red like Rudolph’s nose. Amazing! Two weeks ago I snapped photos of my finger joints because of joint swelling, severe pain and lateral movement. I emailed them to my Rheumy who said, “your RA isn’t bad”. I then felt I had to dig up older photos of my hands so he would actually be able to compare photos instead of just dismissing what I had to say. I was partly angry and partly disappointed while I was frantically searching through photos with no success. My hubby put his hand on my shoulder, looked me square in the eye and said, “I believe you”. I just cried. While most of my complaints go unheaded by my Rheumy (who is literally THE director of Rheumatology in a big medical university in my big city), I am constantly reminded that I am not alone. Because of this I am now an advocate in my community. (I don’t look sick because I have a smile on my face and work full time, right? Ugh!) Thank you Kelly! When I was first diagnosed my right elbow blew up to the size of a grapefruit and was bright red. Since then, I haven’t had nearly as much swelling and redness but both come and go. On some of my worst RA days, there was no visible swelling or redness. I don’t get a lot of redness but my swelling is out of control. My elbows and knuckles are the most noticeable. I used to have nodules on my forearm as well but that sends to have gone away. It’s scary to see the swelling but we try to keep good thoughts! I have had swelling and pain only, never redness. I think back a couple of years ago when I lost confidence in my rheum doc. I asked a couple of questions and mentioned something I had read. He did not respond well. Told me I had nothing to complain about. I held out my very swollen hands and said ‘what about this’. He told me it was not RA. Then he said I must have the 4 symptoms – heat, redness, pain, swelling. If all four were not evident, it was not RA. Since I showed no redness, it was not RA. After drying the tears, I realized I no longer needed him to verify how I felt. My joints rarely get red. They are almost always swollen though, and very stiff. Definitely different for everyone. Kelly, even I, as a nurse and the daughter of a mother who was a PRD, never saw joints that looked particularly “red” or inflamed – not even in textbooks. My joints occasionally get a little “pinkish,” but not overly red. I wasn’t sure I had RD for years. Some othr kind of inflammatory disease, maybe. But my rheum doc said “RA.” Maybe without the MTX and other “poisons” I take, my joints would be more red than pink. (My husband holds me [very lightly] as I deal with the MTX side effects after my injections, and reminds me that without those poisons my joints would be like my Momma’s, that I probably would be going blind and deaf like she did. Sometimes it just isn’t very comforting.) So, today I have 12 “pink” joints, 16 “stiff” joints, and 3 fingers in various stages of “triggering.” Does this mean I “finally” have RA despite STILL being seronegative?? My rheum doc puts the RA code in at each visit, so HE knows I have RD. Red/pink joints or not. I was diagnosed with hypothyroid and RA three years or so ago. I experienced what I think of as ‘disease shaming’ when I had to change docs last year. The new doc simply didn’t believe I have RA and treated me as if I were seeking drugs or was a hypochondriac.The experience was very discouraging. I’m thankful because I appear to be in remission. My original diagnosis was based on x-rays, low but positive RA factor, and unrelenting stiffness, modest pain, and fatigue. My x-rays no longer show the swelling but it took 2 years to get better. On bad days, my husband will say ‘But you are cured!’ with the irony that chronic disease provides.I’m currently off RA meds. I’m fortunate to have a great GP so I will monitor for joint damage. I wish everyone well and don’t let any doctor give you doubt about what you are experiencing. My disease shaming sent me back to my labs/records and on a mental journey through the last two years of crappy health. My condition is not imaginary even if my labs have improved. The info here has helped tremendously. Thanks Kelly for your hard work. FYI to anyone it might help, I am mostly grain free, upped my vitamin D3, take a multi-vitamin, and take magnesium. I eat mostly home cooking. I am looking into lowering oxalates as they are known to sometimes settle in the joints. What I noticed in your picture of your hands and feet, Kelly, is what I find a much clearer indication in myself of my actual levels of pain and swelling: vasculitis. I know it isn’t the severe clinical terminology vasculitis, but while my joints do get pinkish, it’s the bulging of my veins where close to the surface and my near-vampiric pale skin taking on a zombiesque patina from the tracery of veins that become visible below the skin that are one of the clearest signs that my level of inflammation is high. It’s still hard to catch the bruise-like discoloration and distended veins in a photo, but not as hard as capturing “redness.” I just wish I knew why mild vasculitis is never even mentioned as common….discussions of vasculitis in RD are always solely limited to the very rare, life-threatening disease-in-itself. Will the redness always be warm? Will it always be painful or tender? My hands look a lot like the photos but they are not always sore or painful. Good question. First – remember we are not all the same. AND the disease does not always act the same over time in the same person. The redness is not always warm, swollen, or painful. It seems different cytokines are separately responsible for each symptom. My first “red” joint – the right middle mcp – was constantly bright red for months and then it started hurting. No doubt obvious swelling is around the corner in my case – it follows pain after a while. I’ve been having pain for a few months now. Pain in shoulders, pain in the ball of my foot, pain in my jaw, and swelling in my fingers and toes. Last week, my middle knuckle on my left hand swelled, was especially tender, and even a little pink. A week later, the same knuckle on my right hand did the same, only to an even greater extent. I finally went to see my GP today. He said it couldn’t be RA, because if it was, all of my knuckles would be swollen. He said that pain on the ball of my foot (which has me limping some mornings for a good hour or so) was probably Morton’s neuroma. He referred me to a podiatrist. The TMJ pain was probably anxiety, so he gave me valium to sleep. I felt like an idiot for even suggesting RA. He insinuated that if I wasn’t writhing in pain, I couldn’t possibly have it. After reading through this site, I’m not so sure I’m an idiot. I guess I’ll see what the podiatrist has to say. Holly, I’ve never met this doctor, but you’re not the one who sounds ignorant in this situation. Poor training like this is too common. The podiatrist might help. My podiatrist was the one who diagnosed my RA / RD. I still count on them for good care because rheum doctors have usually ignored my feet – not even letting me remove shoes. If your feet are worse in the morning, try to go see the foot dr in the a.m. If you do have RD, try to find a rheum specialist who knows more. Best of luck. I have dark skin so even when my joints were incredibly swollen when my RA first appeared, they burned but weren’t red. I left the doctors office in tears many times early on, though I think that was more the prognosis and lack of any empathy or bedside manner of the doctor as my body destroyed itself at 27 years old and had a newborn baby boy. It took 5 months for me to get a diagnosis and by that time, I could hardly walk without crying. Once diagnosed, my case has always been moderate to severe and my joints were never red. I wish doctors could detect earlier the RA/RD attack, by the time the joints are that painful or red, irreversible damage is already done. Gentle hugs to you and your community. That’s true Kelly, my rheumy never asks me to remove my shoes and my hands and feet are the worst. Holly, I hope you get another opinion. 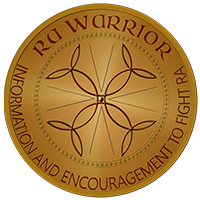 You don’t want to be writhing in pain before you are diagnosed with RA. I have pain in the balls of my feet because the cartilage is gone but it is worse on my left than my right. Hope the podiatrist can help, it’s just an xray to see if that cartilage is gone. The limp I have has just caused me more foot and back problems so best to get it checked out. Take care. 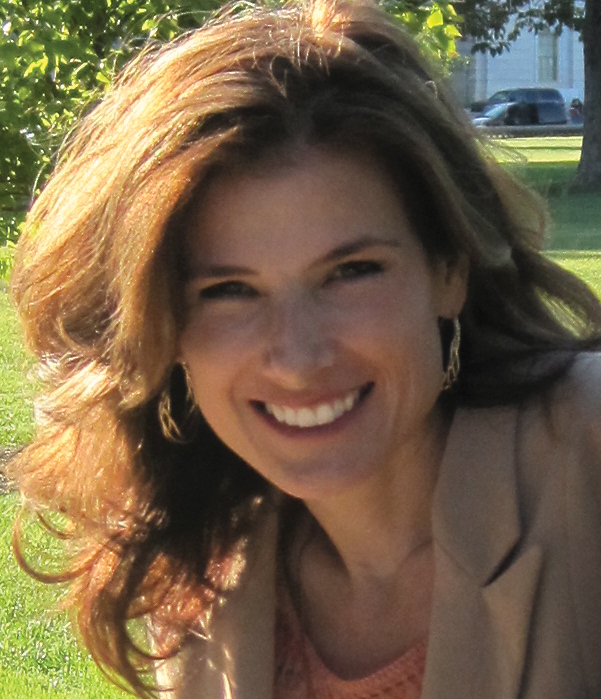 Kelly – I wanted to thank you for your site, once again. You and your site have been on this medical (nightmare) journey with me from the beginning of my research into the cause of my symptoms (2011). Maybe I should do an inset story for you! Anyway, to keep my comment short (lol), I wanted to share that the whole, redness, heat, swelling thing is simply a non-objective experience from a doc. Only we, the patient, know our baseline. That fact was rudely personified when my (cash-paid – took no insurance – top 3 doc – in the Dallas area) rheumy said the most……uhmmm….searching brain for adjective….okay, can’t find one…..this thing to me. I said, “Right now my hands are swollen.” He arrogantly, with cutting eyes, observed my hands from across the exam room, and said with a smug, all-knowing smirk, “If you say so.” This same scenario repeated three times. After the “exam” was through and his nurse was finishing up I had finally found all my photos on the phone. After seeing a few of them she agreed to call the doctor back in to see the photos of my “normal” hands and the extreme photos that were worse than the hands I was presenting that day in his office. There is much more to this story. I just wanted to say, that over the years, I have taken your advice and always take pictures of my body when it shows evidence of disease activity. I also realized that I should begin taking pictures of MY baseline. In this way a more true comparison can be made as to disease activity. Another way to show a baseline is old photos; maybe a wedding ring photo where your hands are clearly visible and in good light. I also have found photos of my grandmother’s hands when asked about family history. She was never officially diagnosed. Her disease began in her early twenties. Anyway, God bless you and all your readers. thanks for sharing Dee. I have had the same experiences over and over until the swelling was very extreme. I have bony knees, feet & hands that have almost no fat layer so they can be swollen & look just like what is normal for others. Also when the membrane around tendons swell, it’s visible on the palm side, which rheum docs usually don’t accept – only the back of the mcp from across the room as you say. Shameful education. And inexcusable attitudes. So I’m kind of a photo nutcase I guess now. I have thousands of joint photos – normal & swollen etc. All my finger toes and feet and wrists STAY red ALL the time! But they have constant fever and swelling too! Lol!! 🙂 But then this morning I woke up with swelling AND redness in the soft spot just below where my Adam’s apple would be (if I were male lol) and I am having some esophagitis / gastritis issues from the plaquenil!?? But I’m also having cervical lordosis, caused by muscle spasm? From inflammation, disc bulg, degeneration from the RA, in C4-C7, of which the Dr wants to do “facet” injections to get inflammation calmed down in?! I’m SO SO tired (and broke) of being at the Dr EVERY time I turn around! I am going to start the daily Prevacid tonight to make sure and calm down the “esophagitis” and “gastritis” in case that is what is causing it….and I couldn’t get the search button to work to see if there were any other posts re: same thing on the website! Has anyone had this same issue?! Swelling on the soft tissue part of the front of my neck, and it getting red was a little concerning! Lol! Was kinda like oh great… Here we go again…something new to contend with! Hope it has something to do with the “backside” neck pain?! Not the esophagus/tummy stuff cuz SO far I’ve been ok in that area! And if they pull my Meloxicam because of that…I won’t be able to MOVE!! I don’t function without it! ☹️ Any info would be appreciated!! Linda, I’ve been experiencing what you’re describing in the area below where my Adams Apple would be as well recently. It was causing throat pain and a wheezing sound in the same area. Turns out my thyroid has been swelling and I’m hypothyroid. When I first went to my doctor, I didn’t think I had any redness or much swelling. However, while examining me, my doctor said I had a lot of redness and swelling in my hands and feet. She explained that in most people redness isn’t usually red, just a slightly darker color than the rest of your skin. Mine look like lightly tanned bands around each knuckle, kind of like stripes. I see it now.